← Great things start with a Yes! A group for independence-supporting Scots Asians are launching a new branch in Scotland’s capital. Scots Asians for Yes is hosting a public meeting in Edinburgh tomorrow (Monday) with an array of speakers, including one of Scotland’s most prominent businesswomen and political figures who will tell the audience that our Asian communities should be ‘front and centre’ of the debate. Tasmina Ahmed-Sheikh, an actress, lawyer and member of Yes Scotland’s advisory board said: ‘It’s time to put Scotland’s future into Scotland’s hands, so that, together, we can build a nation which works for all of us. 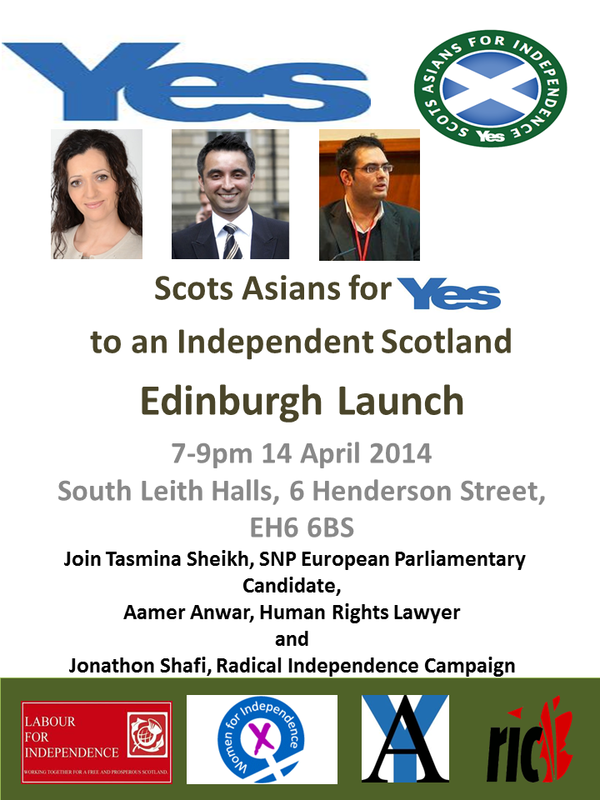 ‘I want Scotland’s Asian communities to be front and centre in this debate. And I want to play my part in persuading them that not only is an independent Scotland possible, it’s the best and only opportunity we have to realise our hopes and our dreams for our families and our country. Ms Ahmed-Sheikh will also be joined by the well-known human rights lawyer Aamer Anwar and grass roots campaigner Jonathon Shafi. Mr Shafi, a member of the Radical Independence Campaign said: ‘Independence is a chance for our society as a whole to embrace diversity. We have seen nothing but fear and division come from Westminster, from immigration vans to illegal wars.